1. As I wrote about at length before, Lucy and I had a lot of trouble with the whole nursing thing. After many failed attempts with latching and my low milk supply, I switched to pumping and formula feeding. At first I was doing about 50-50 but lately my milk supply increased to the point that I was only feeding Lucy one 4 oz. bottle of formula a day, if that. However, I was still reluctant to try nursing again because it had been so painful and so stressful. But then yesterday evening, Lucy was about ready to eat again, I didn’t have a bottle of milk pumped, and I was not excited about the idea of sitting down to pump again. I said to myself, “OK, tonight’s going to be the night that we make this work.” I sat down with Lucy, and after just a little bit of squirming and fussing, she latched on perfectly. I was able to nurse her for 30 minutes total! I was astounded. We had three successful nursing sessions today, too. I think I want to continue to pump some to give me flexibility, and I am definitely a bit sore, but it made me SO happy to be able to nurse Lucy. 2. 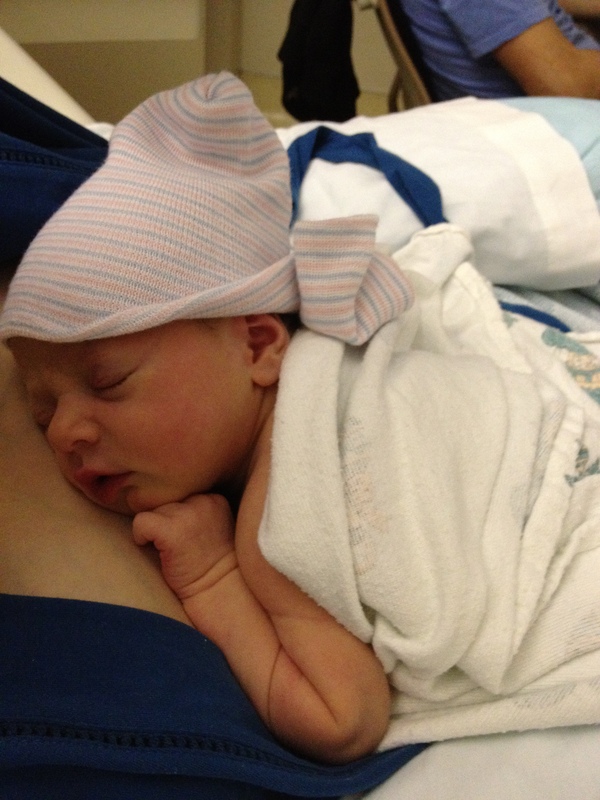 After I nursed Lucy at 7 pm, I was afraid she’d want to be fed late at night or in the middle of the night. But instead, she fell asleep at 8 pm and didn’t wake up again until 7 am! This is by far the longest stretch of sleep she’s ever had. 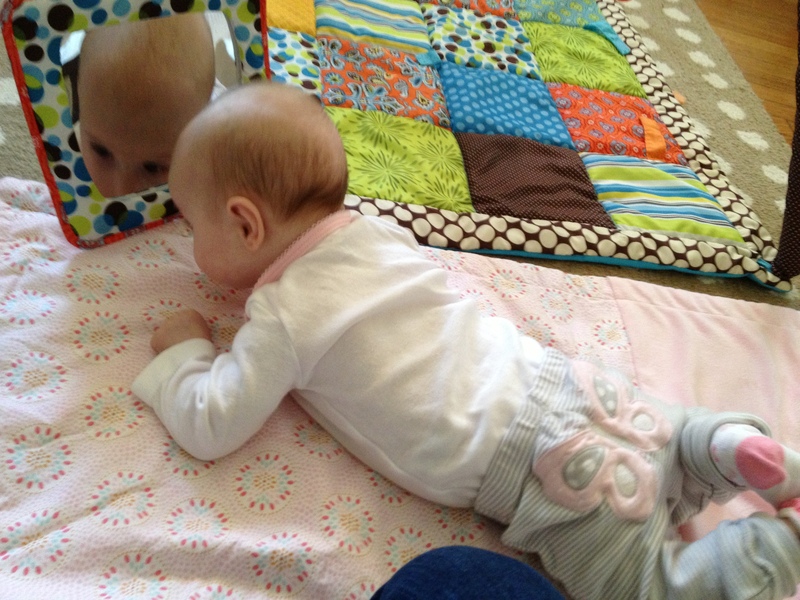 Tummy time – about to roll over! Lucy and I also attended our first Mommy & me class on Monday. There were only 3 other mamas and babies, but we learned some interesting information about baby sleep and other issues, and I discovered that Lucy loves to play with colorful rings (I bought some immediately on Amazon and they arrived today). I can’t wait to see what happens in the coming weeks. Tomorrow, Lucy and I are going to my office so that she can meet everyone and I’m having lunch with one of my colleagues. It is slightly giving me hives, thinking about being back there, but at least I know I don’t have to do actual work.